Estimates say that as many as eight out of ten new businesses fail within the first eighteen months. More conservative estimates say that about half of new business start-ups are still in business four to five years later. In either case, the likelihood of business failure is very high. Studies prove that good planning practices more than double the chance of business success. Yet, the vast majority of small to medium sized businesses operate without a formal plan, and of those who do build a plan, only a handful carefully measure their targeted objectives and adjust their plans accordingly. 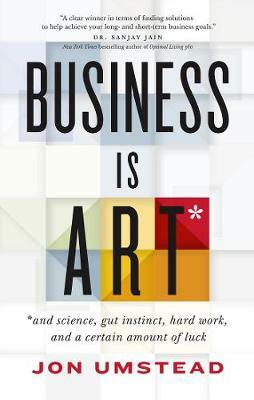 Business Is ART provides business leaders with an easy-to-follow approach to business success. The book is intended for any business owner, executive or organizational leader, but is especially designed for the small to medium sized organization. Its purpose is to provide a simple process--with templates--that business and organizational leaders can follow, from the creation of a powerful vision, to strategic business plans, to performance metrics and back again in a continuous cycle of improvement. Created by Jon Umstead, and tested over a thirty year business career, the ART program shows business leaders how to successfully Articulate their vision, Revise their plans, and Track their progress. Umstead draws on personal anecdotes and experience, as well as wisdom from other business leaders, to create an engaging, accessible and empowering guide to business success.